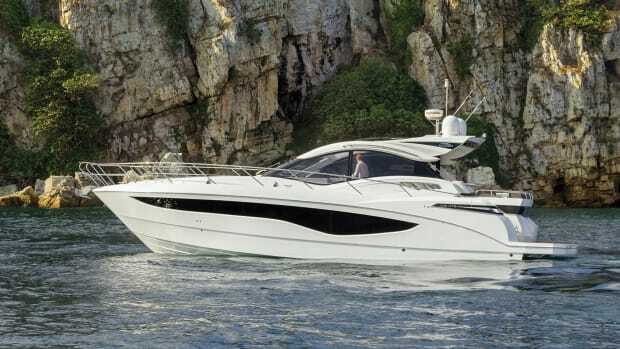 The curvy Z55, from Dutch builder Zeelander, is a sprightly performer imbued with zest and style. 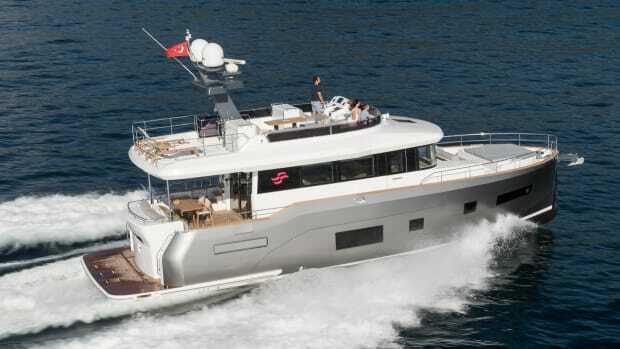 The Zeelander Z55 offers performance to back up her appearance, with a top end near 35 knots. 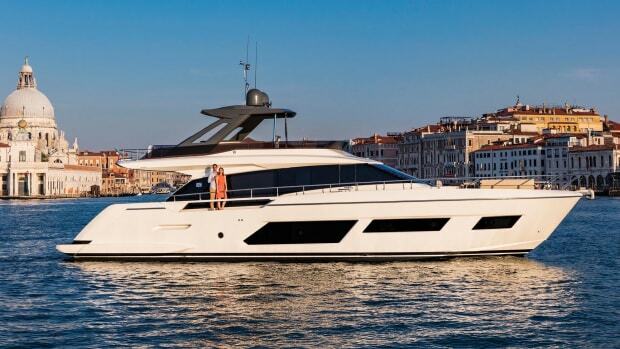 Dutch builder Zeelander adds some superyacht features to the curvy Z55, a lively performer with a look all her own. With her voluptuous curves, a long, elegant sheer, and a purposefully flared bow, the Zeelander Z55 appears at first to be little more than a thoroughgoing exercise in American retro styling. You could easily imagine her as a Prohibition-era rumrunner. But looks can deceive. 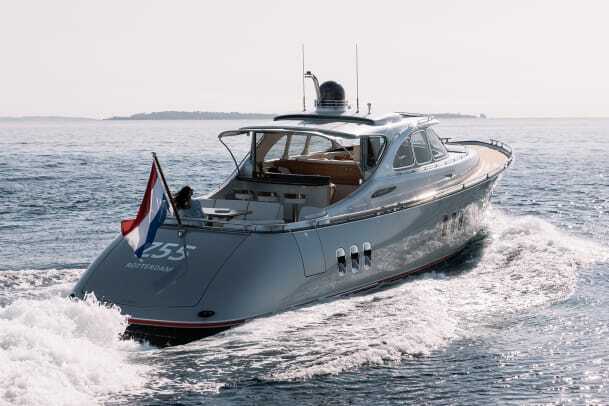 She is, of course, Dutch-built, and with her fiberglass construction, IPS drives, high-quality detailing, and midships tender garage, she is not so much a styling exercise as a thorough exploration of modern motoryacht design—and a surprisingly successful one at that. 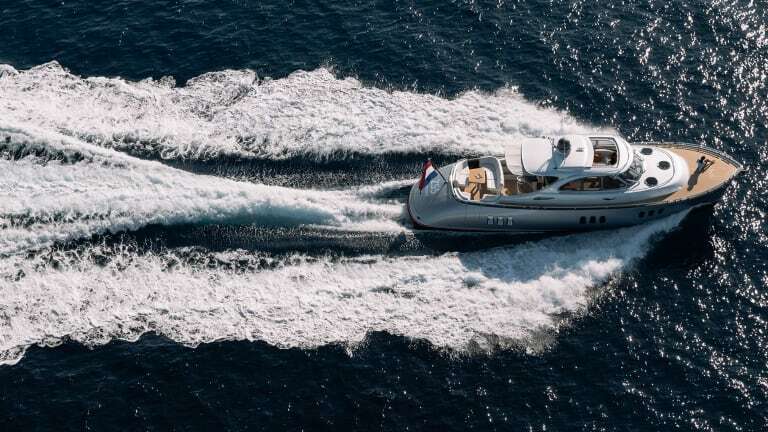 Taking the Mulder-designed hull of the shipyard’s earlier Z44 model, superyacht naval architects Van Oossanen scaled it up and tank-tested the result, which was optimized from the outset for Volvo Penta’s IPS propulsion. 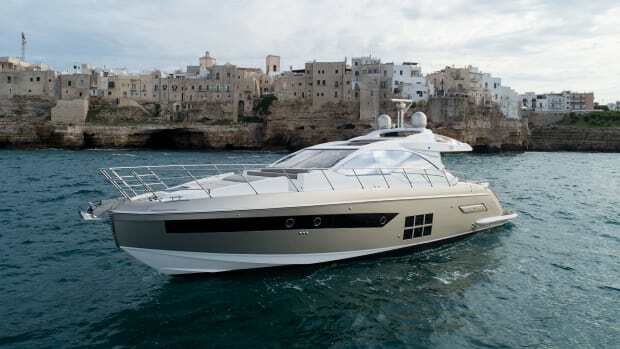 Twin 725-horsepower IPS 950 engines are standard. 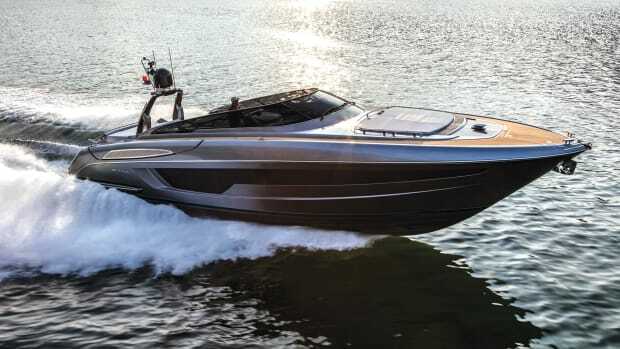 Our test example at the recent Cannes boat show, the first Z55 to be exhibited in Europe, was fitted with the larger 800s—known as IPS 1050s in Volvo’s willfully confusing nomenclature—while 900- and 1,000-horsepower options are available if you prefer. In the cramped corner of the Vieux Port where the Zeelander glinted in the late-summer sunshine, few boatbuilders were taking their charges out on sea trials, no matter how nicely they were asked—it was simply too crowded to get them safely in and out. 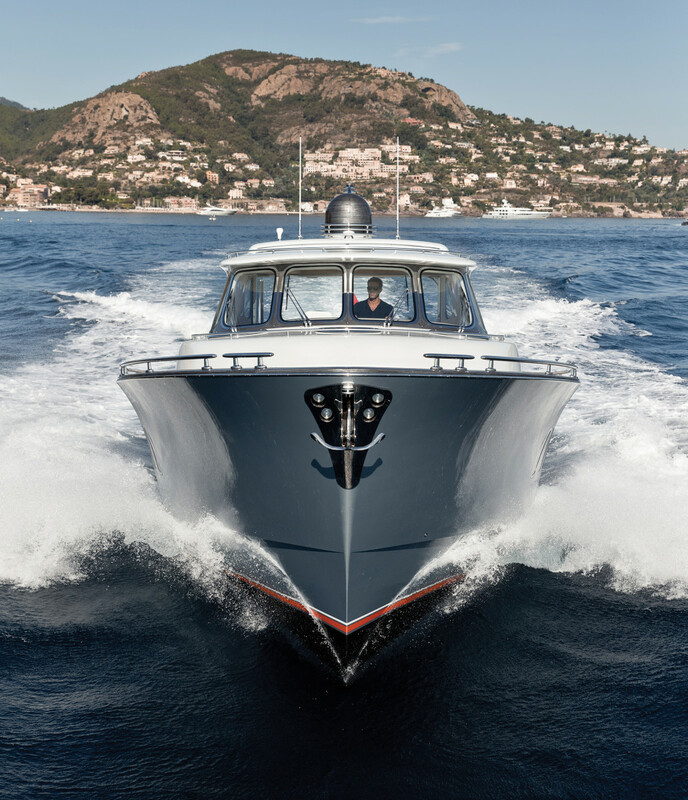 With its joystick controls and swiveling IPS drives, however, the Zeelander slipped out serenely from its quayside berth, dodging overhanging anchors and negotiating mooring lines with a calm competence that didn’t go unnoticed by those aboard neighboring boats. In typically balmy conditions we recorded a top speed of over 34 knots, with more than half a load of fuel and water and the Williams tender on board. Performance topped out about 150 rpm shy of the engines’ rated maximum, so it’s possible that she could make an extra knot or two with different propellers. 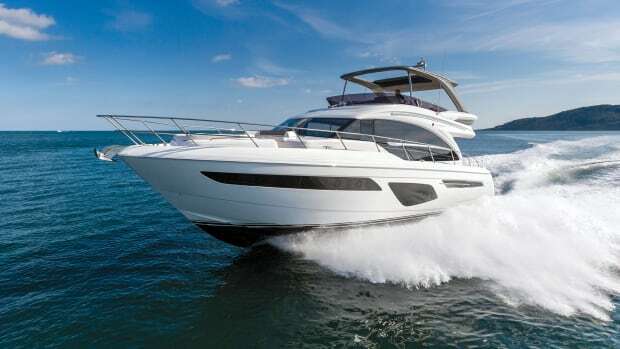 With a moderate-V hull with just 14.5 degrees deadrise aft, the Z55 accelerated well and proved both accurate on the helm and responsive on the throttles. The hull design carries this modest deadrise well forward, so when charging through our own wake—the only decent waves available on that day—it was easy to create firm impacts with the broad panels of the forefoot, especially when taking the seas at an angle. When slicing straight through them at 90 degrees, though, the ride proved adequately soft and comfortable. A mildly distracting rattle from the sunroof was easily cured during our sound measurements by company CEO Ewoud Vroegop, who reached up and held it. A more permanent fix was arranged. 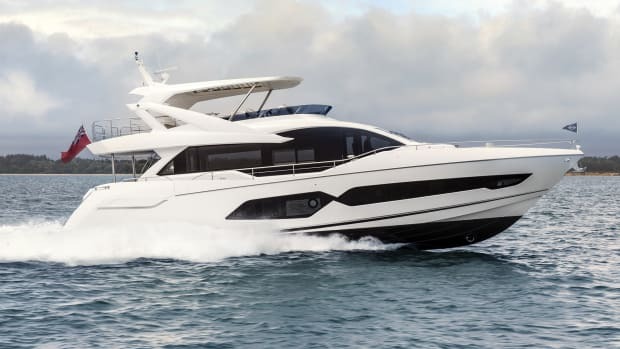 The all-around sightlines from the helm are remarkable for a hardtop boat, and that gets to the heart of the intelligent thinking behind the Z55’s design: It’s not just the helmsman who gets a good 360-degree view, but everyone. 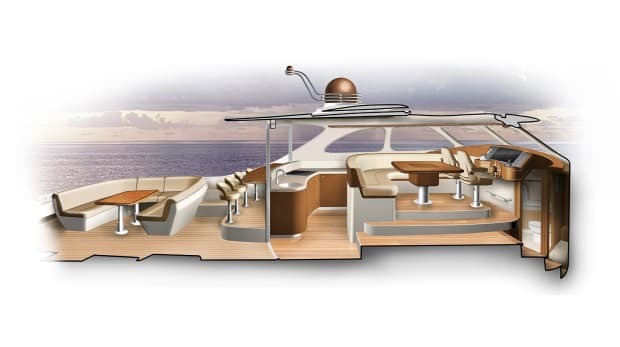 The raised sofa surrounding the central dining table puts the passengers’ line of sight at the same level as the helmsman’s. In fact the helm seats turn to join the dining table. The galley, laid out along the back of the sofa and open on both forward and aft ends, feels at the center of things on the main deck. 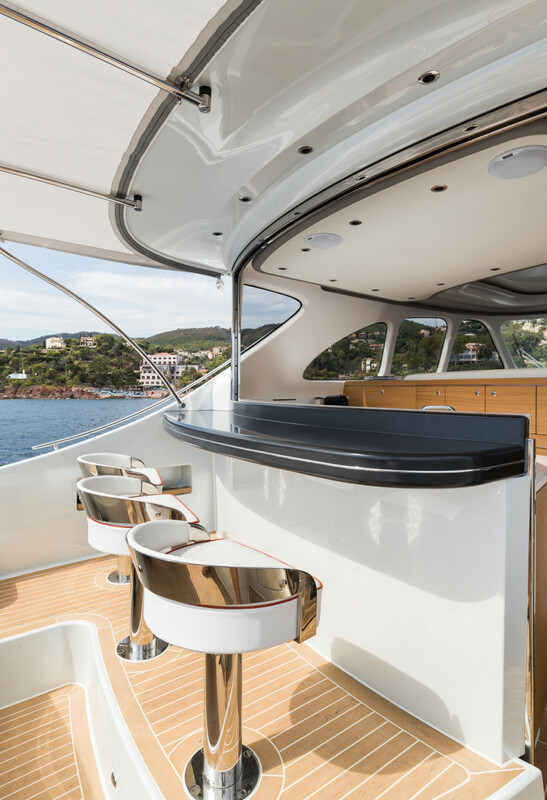 A glass door to starboard is complemented by a curved glass partition that rises between the galley and the bar, so that even when sealed off from the elements, both salon and galley benefit from clear vision all round. 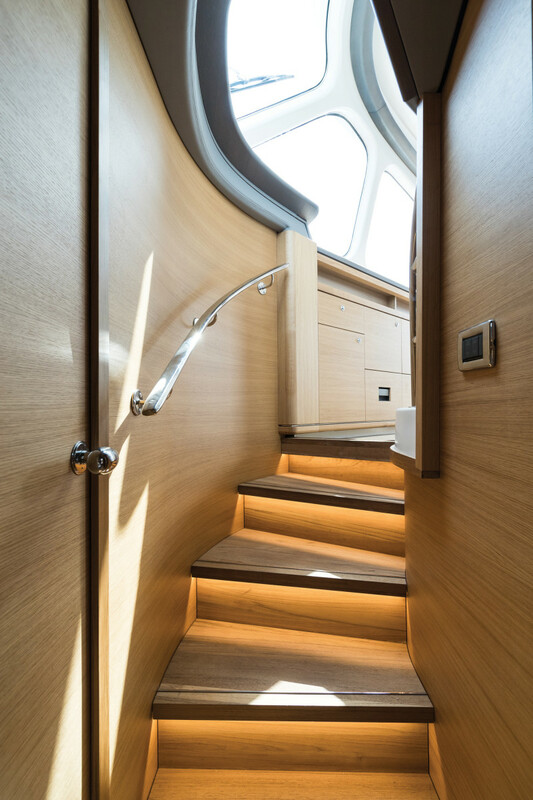 The lower-deck accommodation exhibits a similar level of intelligent design, courtesy of the distinctively named Dutch studio of Cor D. Rover. It is slightly disconcerting at first to be faced by a curving array of four doors at the bottom of the companionway—five if you count the hinged panel protecting the electrical panel—but the layout behind each one is logical enough in its way. A compact twin-bunk cabin to starboard might be put to better use as stowage space, but once you’re in there the beds are full size and there are some useful lockers. The VIP suite in the bow has been cleverly arranged on a diagonal to increase the usability of the floor area, and although it is certainly true that its big double berth is mounted way too high for anyone much past middle age, it is still a comfortable sleeping cabin, with its own door to the guest head. This head also has a door to the passageway for dayhead use. Tucked under the salon table and sofa, the amidships cabin is a surprise. Headroom is good over the floor—6 feet 7 inches—reasonable over the foot of the bed at 40 inches, and even acceptable over the head of the bed at 28 inches. 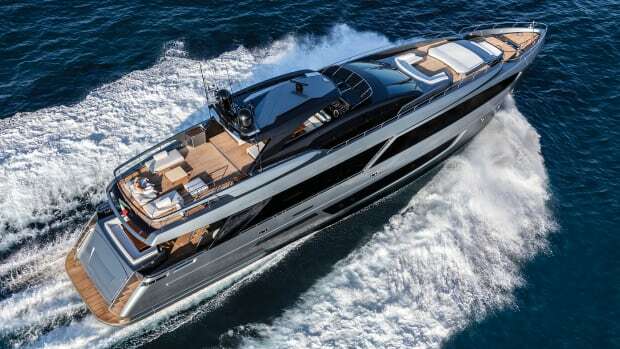 The bed itself is a giant 6 feet 10 inches long, and with stowage available in various cabinets and along the entire aft bulkhead, plus a dressing table and a generous shower compartment—where you’ll have to be very careful not to soak the carpet—it’s a genuinely luxurious master suite. The Z55’s tender-handling arrangements are also surprising. 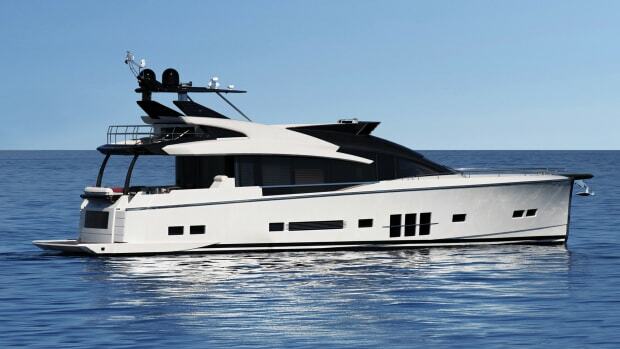 There is simply no room in a hull this size, with a big fold-down transom and IPS drives, for a conventional tender garage in the stern. But have a look at the layout plan: There’s the Williams 285 Jet Tender, neatly stowed just forward of the engine room in a special athwartships compartment, served by a topsides hatch that opens out on the port side. A smaller hatch on the starboard side of the cockpit sole provides access to an electric winch. From here you can give the tender a shove to launch it, while the shape of the floor tray encourages the RIB to align itself properly as you winch it in again. 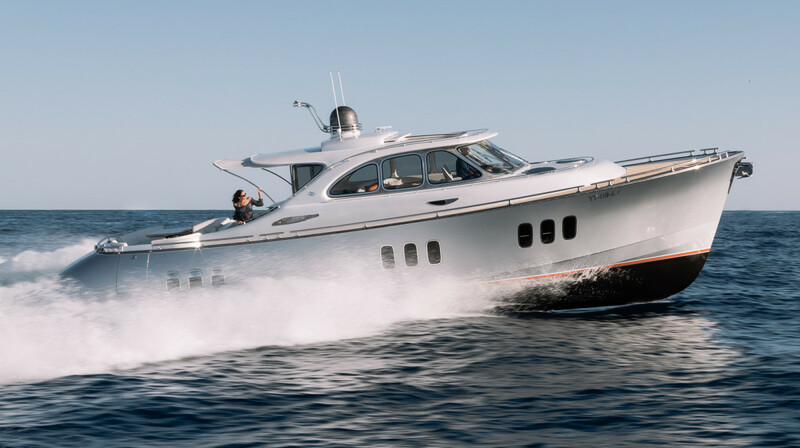 The Z55 throws a few superyacht-worthy curves, including the folding glass window aft. Ingenious it may be, but as a system operated by a family crew it will need careful use. There is no room in the compartment for anything but the tender, so don’t send anyone down there who is not expendable: Any momentary inattention or malfunction of the winch could have consequences. It might be a good idea to make sure to deal with the tender before cracking open the Sancerre. But perhaps the most surprising feature of this surprising boat is an external detail that virtually every guest you bring aboard will need to have pointed out. The fine-grained hardwood finish that adorns the deckhouse sides and caps the gunwale is neither fine-grained nor hardwood. It’s not even a veneer, carefully glued in place and brought up to its present rich luster with numerous coats of varnish. It’s not wood at all, but fiberglass, hand-painted to order. By a magician. I don’t care how close you get to it, you’ll still be scratching at it with a fingernail to feel the grain. The detail is so complete that the joints between the planks even have the telltale stain of water ingress that suggests you might need to strip it back and re-varnish—not right now, but maybe in a couple of seasons. Relax—there are no planks, and no grain. Looks can indeed deceive. LOAD: 420 gal. fuel, 100 gal. water, 7 crew. Speeds are two-way averages measured w/ Garmin GPS. GPH taken via Volvo display. Range is 90% of advertised fuel capacity. Sound levels measured at the lower helm.